Large saltbox house with open floor plan. The first floor includes kitchen, dining room, living room with fireplace, and TV room. Private dock with off shore float. Ideal swimming and boating location (no power boats). Bridgton has many restaurants, a quaint turn of the century movie theater, and a drive-in movie theater that operating in the summer.months. The house is 20 miles from North Conway NH. There are also many cross country and downhill ski sites available. Linens are not provided, all renters will need to bring their own linens and towels. We have a TV with a VHS and DVD player attached. There is no cable or wifi at the house. We have a few boats available to renters. The lake doesn't allow for motor boats. There are many ski mountains near the house. Shawnee Peak is the closest to the house and about 5 mins up the road. There are many nearby golf courses. We have been vacationing at the Hinchey house for 18 years now. We love some of the updates wifi 1st time in all these years. My kids are now all adults and we still love coming to Bridgton and the pond for our family vacation. Can't wait for next year. This house has everything you need for a perfect summer vacation. We had 8 adults and loved having the kayaks, paddleboard, canoe and all the blowup things you could ever want for the water. 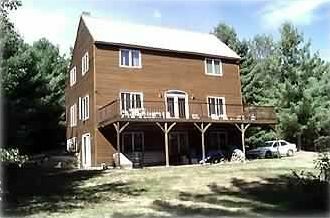 This house is located on beautiful Beaver Pond. The pond has no public access, so it's very quiet and the fish are jumpin'. The yard is well kept and my friends and I enjoyed it playing wiffle ball and touch football for hours. There are a few boats and surfboard type things to float on as well as pool style floats in the basement. The house has its own private dock as well as a swim out raft. My kids enjoyed boating out to the island and exploring! The ping pong table was a pleasant surprise, it looks to be brand new! The kitchen and dining room are separated by a long counter, with several barstools on the dining room side. The dining room opens up to the living room a Woodstove.. I almost wish it was colder so we could have made a fire- very cozy couches and a great place to play a board/card game! The back deck is as wide as the whole house and has 2 gas grills and a shade tent, with a great view of the yard and pond. Grocery store is less than 10 minutes away and the sports bar at the end of the road is a really nice place to watch a game. As for the previous negative review, this house is totally clean and fine. Its totally reasonable to ask guests to pick up after themselves. This house has so many added extras that you wouldn't find at another rental.. Everything you need to cook with, grills, games, sports equiptment, boats/floats and location location location! 1. House has never been cleaned professionally and it seems that is the case cause the guests are asked to clean the property. if you peek under the beds, its filthy with years of dust accumulated. The fan on top of the stairs of 3rd floor has so much dust collected on the edges, that it was unbelievable. 2. If any member of your party has dust allergies, stay away form this house. 3. we as the guests were asked to bring our own linens, ie. from bed sheets, towels pillow cases. As we were taking all this with us we decided to take our comforters as well and I am glad that we did so cause the house is not at all equipped for winters specially when the air temperature outside was -25 F.
4. the beds have lived their good days, they were super springy...... all adults were complaining about the bad beds. 5. Bathrooms were dirty.....again as I said the house was never cleaned professionally. 6. light bulb crashed on my husband while he was cleaning the dishes in the kitchen, out of a sudden the bulb fell and landed part in the sink and rest on the floor, had to double clean the entire kitchen twice to ensure that the crushed glass is removed safely, as we had kids in our party. Thankfully we had friends who saved the stay and we were able to enjoy and start 2018 in good mood. I would not recommend this house to anybody unless the owner if the house starts providing linens, getting the house cleaned professionally after the guests leave and update some of the queen beds. we paid 1550 for a 2nights stay but still had to do the cleaning, change the linens. To follow up on this review. It seem that the renter is not familiar with the difference between renting a family vacation house and a stay at a hotel. We have been renting our ski and lake house out for 30 years and most of our renters our be repeat renters for 20 + Years. The house is cleaned between each renter and since our family was at the house before this renter during Christmas we know the house was left in good condition and it was cleaned for before their visit. All we ask is that renters leave the house as they found it. All there items removed and the furniture in the same location as they found it. Then cleaners come in and clean the all surfaces, bathrooms and mop and vacuum. Again this is a ski and lake house not a hotel and linens are not provided which is stated in the the advertisement and the the directions provided before your stay. Since we don’t have maid service like a hotel this is how we have decided to rent the house for the past 30 years. Also for the weather, we have no control over the temperature outside, but the house is well equipped with 3 zones of heat, a wood stove and a closet full of extra blankets as well as one on each bed. Feel free to inquire if you have any other questions. Or see our other reviews on here or AirBnb for a more a actuate review. Our family of 12 loved our week at the Hinchey cottage on Beaver Pond. The cottage was perfect for our large family. We used the four beautiful bedrooms and having three bathrooms was great!! The kitchen is large and well stocked with everything we needed. Having a washer, dryer, and dishwasher was much appreciated. The big dining room was ideal for all of us to have meals or play games. The large deck is amazing and we used it a lot for sitting and eating. There is a lovely lawn which leads to the shore. Our younger grandchildren swam in the shallow area and the 6 year old learned to swim during the week. The adults all swam and used kayaks and canoes. Because the lake has no public access the fishing is great. All our "fisherpeople" caught several fish each day. Again that 6 year old learned to fish and caught a large bass off the dock.The Bridgeton area is lovely and close to so many nice towns including North Conway, NH. We all agreed that we want to return next summer.